Power quality is simply the interaction of electrical power with electrical equipment. If electrical equipment operates correctly and reliably without being damaged or stressed, we would say that the electrical power is of good quality. Energy management is an important consideration for any business and it is critical that power quality be assessed as part of any energy management strategy. Why power quality is important in electrical installations? Since electrical energy is the beating heart of industry, commerce and development maintaining a quality status in the flow of electricity is vital. It is highly important to have measures of Power Quality in determining risks and possible defects in electrical installations. Dara Switchboards offers equipment and knowledge to register Power Quality problems and to contribute to a solution for your electrical installations. Using complex instruments, we measure the voltage quality and electricity flow in a system. High quality of electrical energy is achieved only if these conditions are met: a good initial design, effective corrective action, frequent monitoring and proper maintenance of electrical assets. Equipment overheating and leading to their lifetime reduction. Increase of system losses, Line losses. Damage to sensitive equipment (PC’s, control systems). Penalties imposed by utilities because the site pollutes the supply network. Why it is important to measure the power quality parameters of an installation after the solar system is connected? It should be emphasized several issues to analyse the recorded data: the difference between the load and PV production significantly influences all parameters measured, that is; when the power produced by PV system is comparable with the power supplied by the main source of the grid, the behavior of the photovoltaic plant is most noticeable in the network, even more because PV system studied is near the substation and there is little impedance between them. Active Power: The load profile of the grid & power produced from PV plant monitoring is a must to evaluate power consumption and the reverse power flow rate to grid. Reactive Power: PV inverters are subject to the action of control systems aimed at providing zero reactive power at fundamental frequency, but several experiences has shown that the filters of inverters are not disconnected consuming reactive power, even when PV plant is not operating. Poor Power Factor: PV system operation impact power factor to unacceptable levels during PV system operation. Most active power demanded by the customers is supplied by the PV plant, reducing the demand of active power from the grid, but reactive power demand is the same. Harmonics Current and Voltage: Harmonics are multiple of the fundamental frequency. Harmonics in our electrical systems are normally caused by distortion of either our Voltage or Current waveform. Major cause of harmonics is electronic loads that draw currents in short pulses. The standard limits THDU to 5%. So high voltage and current distortion, affect the PV system operation. Power quality has become a major concern of both electricity providers and their customers. For customers, the economic impact of power disturbances can range from several hundred dollars for repairing or replacing home appliances to millions of dollars in production losses and cleanup. 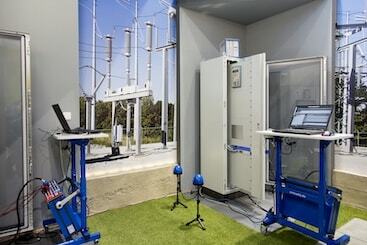 Dar a Switchboards commissioning engineers can visit your site and connect the power quality measuring instruments over a period of time and provide reports on current, voltage, power, harmonics etc.